Almah came into being in 2006 as the solo project of Edu Falaschi, the frontman of Brazilian power metallers Angra. Encouraged by the success of the project's debut release, Falaschi evolved Almah into a full-time band with a fluid cast of supporting musicians. 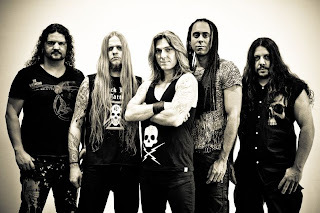 For Almah's third album, Motion, Falaschi is joined by guitar virtuosos Marcelo Barbosa and Paulo Schroeber, drummer Marcelo Moreira, and Angra bandmate Felipe Andreoli on bass. Although boasting three high-caliber guitarists, Almah's sound on Motion is quite unlike anything Angra has released, focusing instead on downtuned 7-string riffs and a discernibly modern heavy metal approach. While throbbing, weighty riffs dominate Motion, Barbosa, Schroeber and Falaschi don't hesitate to compliment the groove with frequent soloing. Only the acoustic ballad "When and Why", which closes out the album, is bereft of fancy fretwork. The remaining nine tracks serve as testament to the trio's six-string skills, as barely restrained solos and enjoyably melodic refrains provide a pleasant contrast to the modern grind of the crushing riffs. "Hypnotized" and "Days of the New" best illustrate such a formula, though the intricacies of several of the other tracks are where Motion finds strength. "Living and Drifting" stands out not for its uptempo, chugging riffs, but for the industro-Gothic keyboard accents that add a nice touch of non-guitar melody. The same can be said for "Bullets on the Altar" and "Soul Alight", though the latter track also brings a furious double-kick, stomping staccato riffs, and some pinch harmonics to the table. Such contemporary sensibilities carry over to "Late Night in '85", a very modern sounding power ballad that wouldn't be at all out of place next to Shinedown and Chevelle on what passes for rock radio these days. Besides laying down riffs and adding atmospheric synth touches, Falaschi's obvious role is to deliver the lyrics in soaring, emotive style. In this respect, too, his work with Almah differs significantly from what Angra fans would expect. He can certainly wail away at the high notes, and his somewhat unpolished style can bring to mind Geoff Tate at times, but now and then a bit of uncharacteristic aggression seeps in to his style. "Zombies Dictator" finds Falaschi at his most extreme as he meshes his thrashy performance with *core-ish breakdowns and Moreira's blast beats. 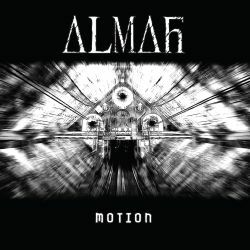 With Motion, Almah presents a rather modern and thunderous take on the power metal style, which fans of Angra will likely either love or hate. Its uber heavy and contemporary sound will also likely cause power metal purists to shy away, yet might find purchase with the tastes of the melodeath and modern thrash crowd. Despite what it's not, Motion is unquestionably a hefty album.